hat schon jemand die Romane gelesen ? wie sind die so ? Kenne die ersten 50 (? ), alle, die auf englisch erschienen sind plus ein paar deutsche. Angenehmer Zeitvertreib ohne hohe Ansprüche, aber ein paar nette Stories sind dabei. ich bezog mich jetzt mehr auf die dies Jahr erschienenen. "Für alle Fälle Kincaid" hab ich gelesen und finde ich gut. Den nächsten hole ich mir bald. Heilegge Scheiße ! in ,,Für alle Fälle Kincaid spielt mein absoluter Lieblings SR Typ Mit Der Coolste Bewohner der 6 Welt. Martin de Vries. Der Größte Jäger der MMVV Infizierten. hab den Roman an einem Tag durchgelesen konnte nicht aufhören. Was natürlich das Größte Kompliment ist das man einem Buch geben kann. - Ich habe an den Roman noch oft denken müssen. - Seit ich den Roman gelesen habe, denke ich anders über Literatur. - Der Roman hat mich auf Probleme aufmerksam gemacht, von denen ich noch gar nichts wusste. - Der Roman hat mich durch eine schwere Zeit begleitet und mir dabei Halt gegeben. "...an einem Tag durchgelesen" ... na, das bedeutet mir ehrlich gesagt nicht viel, macht mich eher skeptisch. Naja, grosse Literatur sind die Romane alle nicht, aber manche sind sehr unterhaltsam. Supersöldners Erfahrung teile ich in Hinsicht auf die Deutschland-Trilogie vom Alpers und die Heitz-Romane. Beide Reihen enthalten eine Menge Murks, bezogen auf das Setting, aber ich habe die innerhalb kürzester Zeit verschlungen und dann alle jeweils im Anschluss gleich nochmal gelesen. Mit der Qualifizierung "konnte nicht aufhören" ist das für Unterhaltungsliteratur doch allemal ein Kompliment. Eines meiner Lieblingsbücher habe ich auch so gelesen...am nächsten Tag Prüfung in der Berufsschule, mal eben noch in das gerade gekaufte Buch schauen, ob das was taugt. Ich packe noch oben drauf: Trotz über 1.000 Romanen hole ich ab und einen SR-Roman wieder aus dem Regal und lese ihn nochmal. Aus der alten Serie gibt es einige, die für zwischendurch gut sind. Ich mag Talon, Skater, Geraint, Argent. Andere, z. B. die Striper-Bücher, sind nicht (mehr) so meins. Hat jemand praktische Erfahrungen mit dem "Alternativen Regelwerk" Anarchy? 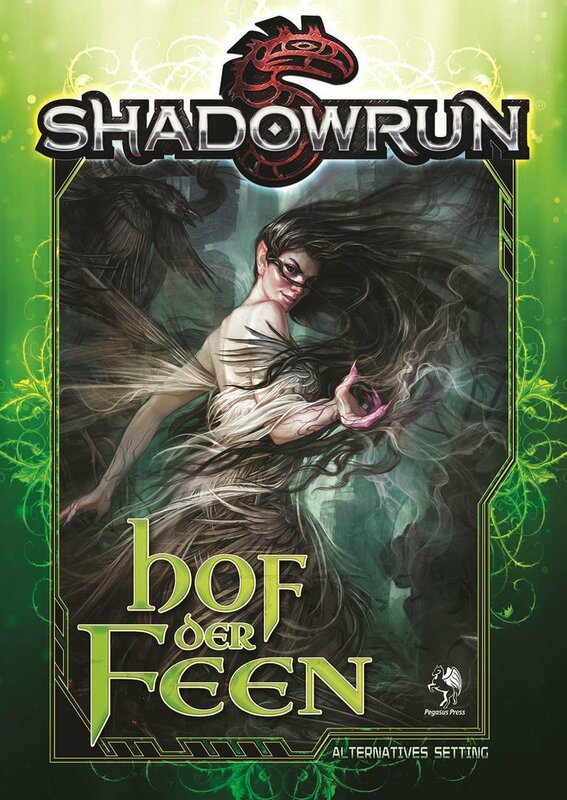 Da ein Tschechischer Chummer gerne mehr zu Shadowrun lesen würde aber mehr Englisch als Deutsch kann wollte ich fragen, was von den alten Sachen vor CGL SR Sachen man nicht auf Deutsch haben kann bzw falls weniger welche Sachen eine Deutsche Ergänzung erhielten und so man auf Deutsch anstatt Englisch haben sollte. das SR4A Seattle Buch ist nie übersetzt worden . U.A. weil in einem der SR4A Städtebücher (Konzernenklaven ? ) schon ein grosser ( 30,40 Seiten ? ) Abschnitt zu Seattle drin war. Vor CGL war Fanpro und das ist 1-3 Ed. Hat hier jemand Hof der Feen und mag was dazu sagen? Yay or Nay? Pros: It is definitely an alternate Shadowrun setting that reinforces a likely different than the usual playstyle, and that playstyle feels natural to the setting they have built. It has a legit, evocative sense of being in a fae otherworld. This is kinda going to be my only pro, so let me stress that this is not a small thing to accomplish. Lots of people try to accomplish this in gaming stuff and don't even come close to success. You are definitely not in a land of humans with pointy ears or funny hats or forehead makeup. This is worth acknowledging for the rarity of that. -A land that.. maybe would have been best served as its own thing not connected to Shadowrun. There is not a lot of space here for, let's be real, the average propensity of Runner teams to solve things via murder and mayhem. I can see a lot of players getting frustrated/not wanting to deal with it. That the default recommending for playing the npcs and generally functioning in court is only a few shades off of "everyone are coming off like douchebags doing a combo of Mean Girls and reading Mystery's book/tv show/whatever" (to put it quickly and crudely) and that the entire thing is about functioning at court, I can only see a sub section of players not finding that deeply off putting/aggravating. Various extended sections of the book are written from this perspective/attitude and people might get deeply turned off by that, or be deeply engaged by that (characters of the court describing various important things like how to act, the local geography, etc.). I don't see a middle ground. -Several things feel really forced as far as making clear what a big deal the Seelie Court has been to Shadowrun the whole time from ancient history to now (207whatever now that is). Guys I do get it, the Earthdawn licence is gone, never to return, and if you ever want to deeply mess around with ancient feeling stuff, outside of using the things that whatever arrangement with the Earthdawn licence lets you use, you have to invent your own. It still feels forced onto the setting in the way that it was handled, and a few times, as I was being put in mind of Mean Girls, I reacted with "stop trying to make the fae happen! they're not going to happen!" -It makes how Tir Na Nog functions as an overall country really murky, if these people with very little comprehension of the mortal world are running it. But then again the Court is presented as a separate entity from all that kind of thing. But then again Brane Deigh is the figurative head of the immortal elf cabal that runs the Tir but is also the Queen of the vastly expanded Seelie Court. And the Danaan elf families that themselves run the Tir/been running it for decades otherwise are unclear as being part of the court or not, or.. something. Tir Na Nog has been Tir Na Nog for decades now without collapsing on itself like Tir Tairngire (which I was not a fan of, so hopefully not to be repeated here), but this all just makes the idea of how it functions baffling. -The book really needs to decide as related if elves are faeries or not. At one point the two are treated as entities so separate that Brane Deigh proclaiming she's been a fae the entire time is treated as a big huge deal (mercifully given previous material, this is stated as perhaps just a bald faced lie as Alachia is standing right there after all), and there is a note that elves are not fae, they are confused for fae. There's then a note that only fae can be members of the seelie court. Yet piles of elves are members of the court. Various beings that existed in the court once it split off from mainstream reality for a while, are noted as being elves. It gets confusing and contradictory and not in a "well fae is confusing and contradictory" way, in a "this doesn't make coherent sense and it is making things feel impenetrable" way. Are the Tuatha De Danaan elves, or not? "Yes" is not a cute, clever answer, it just makes parts of the book not make sense with the other parts on a level of usable narrative. I feel like the book really wanted to say that elves are faeries, but then realized this wouldn't really work at all as far as established SR lore, and so the Danaan parts of the fae are left as this jumbly mess. Or at least whatever they were trying to go for was completely unclear to me. Might just be me. Suggesting the Faeries created the Paths of the Wheel is also a huge and kind of blagh change for me. -the other cultural types of fae than traditional Seelie Court-ish things: This is, being in the Seelie Court, which is more or less located smack dab in Ireland itself mostly or certainly its planar realm is heavily, heavily anchored to it, an odd place to throw in the fae of as many other cultural types as possible, entire races worth. It works better in something like Changeling the Dreaming where the fae are because setting reasons majorly smeared all across the world and especially North America. It feels forced, and "faerie doing colonial reconquest and relocation of each other in their history" is.. I mean it's a legit angle? But it could have then used wayyyy more attention than it got, for that being the idea. -the Seelie Court is reinforced as this big powerful thing that has managed to keep even Lofwyr out. The various given stats.. eeeeehhhhh. Brane Deigh particularly, she might have been a junior member of Dunkelzahn's, "call all the even vaguely benign immortals together for some kind of half populated by d-bags White Council of the Wise", but she got to sit at the table, metaphorical though it was, with everyone else. There are various Runners with more oomph than her in what she does as far as the stat choices they made for her in this book. I suppose that's a personal thing though. -The way hackers, riggers and technomancers avoid becoming utterly useless in a purely magical world feels.. very non subtle, and not weird in a good way, at least personally. I'd almost prefer "they're just less useful here unless tech manages to come up", than "their abilities now become what may as well be outright magical powers, and while for the last people that's not new, the first two?" You can say it's not magic that all of a sudden your mundane as eff hacker is able to hack the minds of mortals that are used as living magic libraries, with the magic equivalent of GOD no less.. buut it's magic. I can see people finding a huge aggravating bother in that, while others might find it delightful. Which basically is one sentence that probably sums up the whole book. -As someone who reads and runs a lot of Changeling the Dreaming, some things felt a bit.. I mean Changeling the Dreaming obviously itself lifts from eight million things, but the Unseelie Court being the ones who believe that magical power is something to throw around wildly (as if glamour is.. say.. free..), following semi apocalyptic prophecies and such, felt a bit on the nose. Also the fae wars and suffering that surrounded the end of the last age of magic felt a lot like the Shattering/Sundering and the wars around it. Honestly those are really easy things to parallel thought though, I'm doubtful this was anything intentional. -I was kinda hoping for more detail on the Tir or the fate of Liam O'Connor (who gets a tiny bit, but it all heavily ties him into the Seelie Court, which again murks stuff up as per above). But that's just personal stuff. -I am really thin on how the lower grade runners that late era SR 4e/5 spends a decent chunk of time emphasizing as player types are supposed to meaningfully interact with this joint. - no rules for fae characters, unless I super missed it. This feels like an "oh come on". Especially with the elf fae confusion and especially with the many fae races. I mean they get stats as critters (some of them), the other fae races, but c'mon. It feels like a missed opportunity as far as "play within the thing like you are a member of the thing". And yes, more CtD comparisons, but they're gonna happen anyway, so you may as well just go for it, y'know? Is it worth a purchase? Iiii... maybe? It certainly does something very different with Shadowrun. Maybe wait till Shadowrun Anarchy comes out to use with it, I really do agree with the book that it feels suited to the idea of that (there's very little mechanical stuff in it for instance). And also maybe only if you're sure you have the sort of gaming group where you feel comfortable with talking out something like "99% of the npcs are going to be these passive aggressive jerkstores and will expect you to be like that also, and also you can't really solve this issue with violence" defining a lot of the rp. tl;dr: Gute Grundidee, schlechte Umsetzung. Bleibt dem Shadowrun 5-Niveau treu. Also eher NAY. Schade eigentlich. Sooo schlecht fand ich "Hof der Feen" gar nicht, auch wenn mir die Technomancer/ Rigger-Regel recht befremdlich vor kamen, aber es bleibt , wie im eingefügten Review von Uwe-Wan echt Geschmacksache. So würde ich das auch unterschrieben, wobei mir die Technomancer/Rigger-Idee eigentlich gefällt. Gibt es eigentlich schon erste Hinweise oder Gerüchte zu einer sechsten Edition? Wäre ja bald wieder Zeit. Und CGL ist (IIRC) bis Ende 2018 mit neuen Büchern beschäftigt. Hi ich hab gesehen, dass in der 5ed die höheren Cyberware Grade extrem billig geworden sind im vergleich zu Früheren Editionen. Deltaware hat gerade mal einen Kostenmultiplikator von 2,5 (irrc waren 8 in der 3.Ed und 10 in 4. Ed). Wie wirkt sich dass im Spiel aus und ist dass eurer Meinung nach eine gute Änderung? wie es sich auswirkt kommt vor allem darauf an, wie die Entlohnung der Runner im Spiel ist. wenn man manchen ofiziellen Abenteuern folgt und die Chars mit einem Butterbrot abspeist ist es Egal ob Deltaware nur noch das 2.5 fache kostet, mann bekommt das GEld nicht zusammen. in besser bezahlten Kampagnen kann sich ein Streetsam ab & zu was leisten (aber nichts was die Ini erhöht , weil Immer noch zu teuer ) , was aber auch ganz OK ist, da die Erwachten Chars meist nichtsdestotrotz trotzdem besser wegkommen, sodas es wenigstens dadurch (ein bischen ) zum Ausgleich kommt. Durch die (zum Teil Lächerlich) hohen Grundkosten macht sich SR5 sein eigenes Flair kaputt. 'ware ist auf der Strasse eigentlich kaum zu finden . Der billige Barkeeper mit Cyberaugen ? nicht wenn die Augen 20.000 ¥ kosten, soviel wie seine gesammte Bar . Massen von billigen Arbeitssklaven die mittels Talentleitungen zu unwissenden Plebejern werden ? Echt so dramatisch, hossa, für mich sahen sie zuminedestns immer noch deutlich niedriger als in 3ed aus (in 4ed hatte ich mal reingeschaut, hab aber nie die Zeit gefunden es mal zu spielen).